There was a time when it was almost impossible to find a bargain buy in the run-up to Christmas. Prices stayed high until Boxing Day and if you wanted to buy that special gift, you had to cough up top dollar for it. These days things are very different and it is largely thanks to the boom in online shopping. Online retailers offer low prices all year round and their strategy at Christmas is to push prices even lower to attract more customers. It means there are some amazing deals to be found and it is little wonder that so many of us are turning to the internet to do all, or most, of our Christmas shopping. But online shopping does have to be approached with caution. Just like there can be a pickpocket in a busy Christmas shopping centre, so there are also plenty of hackers out there looking to take advantage of our search for an online bargain. Make sure you are using a real website when shopping online. A common trick used by hackers is to set up a fake website with a plausible URL, or a URL that uses a common typo of the name of a popular retailer. These websites can often be indistinguishable from the real thing. But if you try to buy from them, you are not only unlikely to get your purchases, but the chances are you will soon find your credit card maxed-out too. Rather than clicking on links from social media sites or emails, always type in the URL address yourself and check carefully for spelling mistakes before hitting Enter. It’s easy for an ‘o’ to be replaced by a ‘0’ for example. Notice how www.onlineshop.com looks very similar to www.onlinesh0p.com. Online retailers are well aware of the risk hackers can pose to their customers and most reputable ones have taken steps to help keep visitors to their website safe. The most common and effective step is to ensure that their website is encrypted. They do this by using the HTTPS protocol, a simple step which stops prying eyes from being able to see any activity on their site. The easiest way to know if a website you are visiting is using HTTPS encryption is to look at the address bar. If it is, you will see a small padlock somewhere close to the URL address. If your retailer doesn’t use HTTPS encryption and you cannot see a padlock in the address bar, our advice is to shop elsewhere. HTTPS is an easy and affordable security step and if they aren’t using it, who knows what other basic security measures they have skipped. A common trick many people use when Christmas shopping is to go and see the products they are interested in on the High Street and then check online to see if they can order them cheaper. As a result, you might be tempted to connect to public Wi-Fi networks in stores and coffee shops to search out the best deals. This can be very dangerous. Public Wi-Fi networks are notoriously insecure and even the most novice hacker will be able to monitor activity and intercept credit details and other personal information. But don’t let this inconvenience you. By using a VPN such as ExpressVPN or IPVanish, you can still use public Wi-Fi networks with confidence. A VPN encrypts all of the internet data on your smartphone or tablet keeping it safe and secure from prying eyes, even on public Wi-Fi networks. By keeping ExpressVPN or IPVanish connected on your mobile device, you can browse online retailers to your heart’s content and even make those big purchases and manage your online banking without any security risks while using public Wi-Fi networks. If you have fallen victim to an online hacker, the chances are you won’t know about it until it is too late. But there is one thing you can do to minimise the damage and its really simple. Keep a regular eye on your bank statements and look out for any unusual activity. You can do this using online banking in just a few minutes and it could save you a significant amount of time, hassle, and money. Compare the transactions on your statement with the shops you used and your e-receipts to make sure that the rights amounts have been taken and by the right people. If you spot any transactions that you don’t recognise, either because it is to a website you haven’t purchased from or an amount you don’t recognise, contact your bank immediately. They will be able to give you more details and take any necessary action to stop your card and prevent any further fraudulent activity. Regularly checking bank statements is a good habit at any time of year, but it is especially important during the busy Christmas period. For any big purchases you might be making online, especially those worth £100 or more, it is a good idea to use a credit card rather than a debit card. This is because credit cards offer additional consumer protection in the event that you do fall victim to hackers or an online scam or face other issues with your purchase. Under UK law, credit card providers are required to help cover the costs of your purchase if it is broken or faulty and the retailer won’t provide a refund or replacement. Or if the item delivered doesn’t fit the description, it isn’t delivered but you are still charged, or the retailer you use goes out of business before delivering your purchase. If you are worried about possible interest on your purchase, be sure to pay off your balance in full each month. Alternatively, you could also sign up for a pre-paid credit card, which offers all the consumer benefits of a full credit card, but only lets you spend the amount you have loaded on it in advance. If you want to be sure of staying safe online over the festive period, a simple rule to follow is to stick to the brands you know. Shopping online at known high street retailers like John Lewis, M&S, or Tesco or reputable online retailers like Amazon, ASOS, or Etsy means you can be pretty confident in their security and privacy protections. You can also be sure that their products and offers are genuine. It can be tempting to head to websites you don’t recognise if you see a great price on something you want to buy. But shopping online this way can be fraught with risk and is often not worth the few quid you might save. A simple rule that you should follow when shopping online this Christmas is, if a deal looks too good to be true, it probably is! If you have decided to make a purchase on a lesser-known website or from a smaller retailer not based locally, it is always a good idea to look around their website to find some physical contact details before buying. Almost all genuine retailers will list their physical address, as well as telephone numbers and email contact details on their websites and social media pages because they want customers to be able to find them. If this information isn’t there, it should set off alarm bells. Without an address, how can customers find their shop? But, from an online buyer’s point-of-view, how can you contact them if there is a problem with your purchase? If there are no physical contact details on a website, our advice would be to steer clear and make your purchase elsewhere, even if it does cost a little more. If the price for a product seems unusually low, it is worth asking yourself how genuine that product is? In China, online retailers like Alibaba are packed full of fake products and these are starting to make their way into the UK market too. Many of these often look indistinguishable from the real thing. But they can carry any number of hidden problems. Fake clothes and accessories are often made from inferior materials which will deteriorate quickly and could irritate the skin. Fake cosmetics could contain any number of unknown chemicals and additives. One of the biggest risks comes from fake electronic products which rarely meet safety standards and can explode and pose a fire risk. Don’t be tempted by these fake products, no matter how good they might look online. It is well worth paying a bit more for a product which is genuine, safe, and long-lasting. There are some great deals to be had online this Christmas, but it is important to stay safe when shopping online. By following our 8 simple tips, there is no reason why you can’t bag some great deals this festive season without taking unnecessary risks. 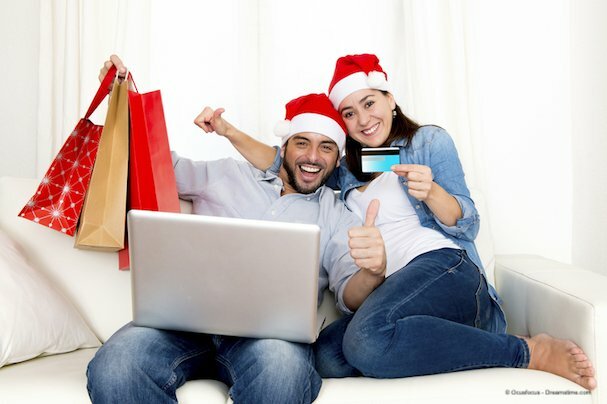 By using reputable retailers, checking the website addresses, and avoiding deals that look too good to be true and fake products, there is no reason why you can’t get some great presents online. And by using a VPN to stay safe on public Wi-Fi, checking for the padlock to make sure your website uses HTTPS, using credit cards for big purchases, and checking bank statements regularly, you can minimise the risk of finding yourself out of pocket to online hackers. A very Happy Christmas shopping season to all our readers!